Nanasaheb Chandorkar was a strict devotee. He observed all rituals. It was his practice that he gave offering first to Agni Dev (i.e. God of fire), then he waited for some guest to come and served him food. After that only he took his meals. He used to read many sacred books. During one of his reading, he came across a story of Seth Sagaalsha. 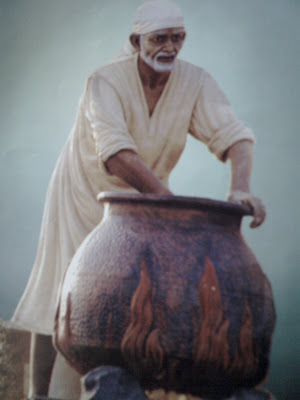 No guest came to the house of Seth Sagaalsha for many days, so he had to observe fast, as it was his practice to take his lunch after feeding some guests. After reading the above incident, a doubt aroused in Nanasaheb’s mind regarding such principles written in Shastras. He thought that if such things are difficult to follow do Shastras comply to follow them? Sai Baba knows all Shastras and so my doubts would be clarified by Him only. so I must leave the matter to Him. One day when Nanasaheb sat massaging Sai Baba’s legs in Dwarkamai, Sai Baba Himself started speaking. He said, ‘Nana! All the Shastras are correct. Shastras never speak useless things, and not even impure things. The definition of human may be different, the thoughts of human may be narrow, but it cannot be said that Shastras are useless. Guests would surely come! Nanasaheb was not reminded that Sai Baba is clearing his doubt regarding Seth Sagaalsha which aroused while reading. So dear readers, whosoever comes to us for satisfying its hunger, we must be ever ready to do so. Sai Baba had said that satisfying one's hunger is equal to doing a Yagna. Simplifying further Sai Baba compared hunger with Yagna and thus it means if we satisfy one's hunger, we would get blessings and Punya of doing a Yagna. What a simple method our beloved Sai has given us!